The KanexPro HAECOAX3 is our 3rd gen. audio extractor designed with 18 Gbps of high bandwidth and supporting the latest HDMI 2.0 specifications. This audio extractor will de-embed HDMI audio streams from any HDMI based device to digital or analog stereo maintaining 4K/60 video resolutions with YUV 4:4:4 color space and pass-thru for HDR 10 (High Dynamic Range). Audio formats include LCPM 2-channel stereo, Dolby TrueHD, Dolby Digital Plus, Dolby Atmos and DTS-HD Master audio with audio sampling rate up to 192kHz. Widely used by audiophiles for de-embedding high-fidelity audio signals up to 192kHz and analog 2-channle stereo audio in residential and audio based home theaters. 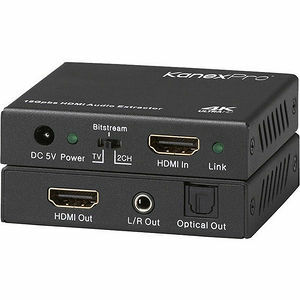 Perfect for de-embedding audio from devices such as, Apple TV 4th generation, Google Chromecast, Xbox One, PS4, Sonos Speaker systems where you can simply extract audio from HDMI and drive it through 2-channel stereo or AV receiver.